In today's post we are revisiting one of our popular infographics in 2016. 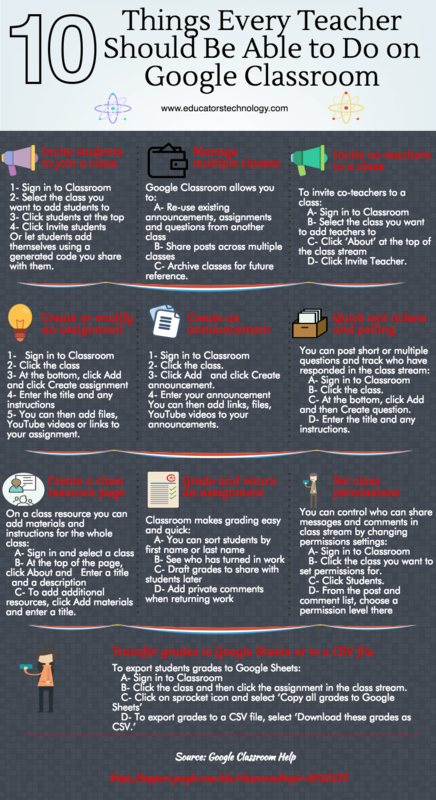 The visual features 10 important tasks teachers should be able to do on Classroom. These include: invite students to join a class, manage multiple classes, invite co-teachers to a class; create or modify an assignment, create an announcement, quick exit tickets and polling, create a class resource page, grade and return an assignment, set class permissions’ and transfer grades to Google Sheets or to a CSV file. The content of this inforgaphic is based on instructions provided by Google Classroom Help. Feel free to download, print, and share the visual the way you want provided you credit our blog as the source.